JSN BuildUp template is the first surprise that we proudly bring to you in this September. 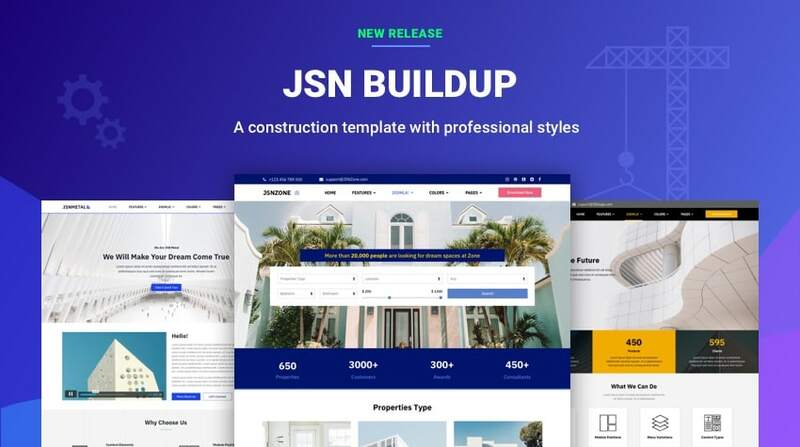 Get inspiration from many customers' demands, JSN BuildUp is a well responsive Joomla template with the designs specialized for construction websites, e-commerce stores for equipment, and housing rental services. Let's take a deep look at this template and enjoy the beauty with us. JSN BuildUp template consists of 3 styles for 3 different niches: Metal (for building corporates), Lego (for construction companies & e-commerce store), Zone (for housing rental services). Each niche template is available with 6 different main colors, which are various choices to build many websites with different brand colors. Many complicated pages are composed by JSN PageBuilder 3 - our most innovative Joomla! page creator. JSN UniForm extension takes the main role to create the Contact form page. Galleries to showcase a company’s works are made with JSN ImageShow. Flexible menu variations (Mega Menu, SideSide Menu and Tree Menu) and rich content types are included. Less but not least: it works perfectly with Joomla 3x. On the homepage of JSN Zone template, every content block is placed smartly on the white background, bringing the first impression of a professional housing rental website. Basically, it contains many areas for an image slideshow with a filter module, main types and featured accommodation, customer's feedback and blogs/news. More than that. To make the homepage look more lively, we have applied a carousel to showcase K2 items in the module named “Top Choices". On the homepage, we want to impress the brand image of a construction company by arranging important numbers right below the introduction banner, providing benefits, famous customers, and outstanding projects. Extra products, customers’ feedback, and the latest news are also important parts. If you are looking for a template with a simple design to build a company website quickly, JSN Metal should be your choice. Setting white as the background color, we place content blocks in a solid design, which express the professional style of a construction company. K2 has been a good choice of Joomla content to create additional fields for article images, videos, podcasts & other audio files, image galleries and attachments. 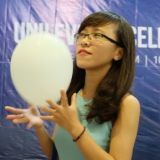 However, to organize and control what extra fields to display, it is not a simple thing, especially with non-technical users. Therefore, we decide to integrate one specialized extension: K2 Filter and Search module into just only the Zone template style to help users sort K2 items more quickly and convenient. K2 Filter and Search module extension is applied in the Zone template. To know more about the main features of this Filter and Search module extension, please click here. The extension is developed by Joomcar, and we are glad to receive their corporation. Please enter the coupon code JSN_DISCOUNT to receive a 20% discount. K2 Filter and Search module is developed to help users to filter their content by several extra fields, tags, category, item text and a lot of other fields at the same time. The truth is that many business owners want to increase revenue, and selling extra products right on their websites is a good choice. J2Store is a top favorite Joomla extension for e-commerce sites, and the store in the Lego template is well developed from it. It is much convenient for your customers to search suitable products by price, keyword, category, and orders. Just click and click, then things appear right on the screen. Note: K2 Filter and Search module and the PRO edition of J2Store is not included in the template. Please make purchases to apply all the stunning features. JSN BuildUp template is our new brainchild for construction Joomla websites, and we would love to invite you to use it and leave comments in order to improve it much more. Thank you for interesting our new template.